Born in Mexico to a Panamanian mother, Avec Guadalupe O’Brien imagined herself growing up to be a great many things, none of which involved produce. O’Brien is now living in Michigan, where she balances an executive role with Mastronardi Produce/SUNSET, family life, and mentorships. When growing up in Mexico City, O’Brien wanted to be everything from an astronaut to the lead vocalist in a jazz band. Most Mexican women at the time that she was growing up were focused primarily on being good wives and mothers, not professionals. And, O’Brien remarks, “that wasn’t that long ago.” In her home, however, it was a different story. O’Brien earned a college degree in business administration, with an emphasis in accounting from el Instituto Tecnológico Autónomo de México. After joining a major global public accounting firm in Mexico City, O’Brien set herself another goal: continue her education in the United States. When O’Brien arrived in Michigan, she wanted to do more than just study business, she wanted to learn a new culture. Though she found that most of her classmates hung out with people who spoke their own language and had similar interests, she immediately began to mingle with the community at large. She also joined a church choir, which happened to be a turning point in her life: it was where she met Joe O’Brien, who would become her husband. They got married and she decided to stay in the United States. Now, the couple has two sons and O’Brien feels that she has found her place in the world. After graduation, in 2002, she became a manager in the assurance and enterprise risk services practice of Deloitte & Touche and would later become a certified public accountant. 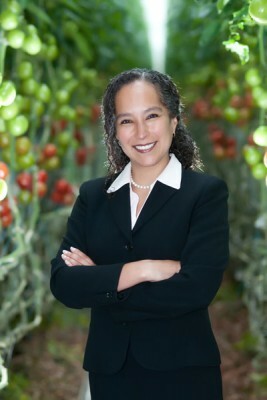 In 2007, she first heard about the Association of Latino Professionals for America (ALPFA) and, along with some of her colleagues, decided to open a local chapter in Michigan. O’Brien was elected the first chapter president in 2008. She is currently on ALPFA’s National Board of Directors. Mastronardi Produce is a Canadian-based company, considered the pioneer of the North American greenhouse industry. Established over sixty years ago, the family-owned business has become a world leader in greenhouse produce, specializing in tomatoes, peppers, cucumbers, and strawberries, with distribution across North America and as far as Asia. Over the years, Mastronardi’s brand SUNSET has become a household name for its produce, and can be found in grocery stores across North America. The company has also won a number of sustainability and greenhouse competition awards. As the company’s US and Mexico controller, O’Brien is responsible for the financial affairs of the organization and focuses on a broad range of financial, operational, strategic, and executive leadership issues impacting the organization in the United States and Mexico. She also works closely with the CFO in Canada. Throughout the years, O’Brien has discovered that she has a passion to inspire other people, particularly Latinas. She says she makes it a point to make herself available as a mentor.